PCBSINO production is fine-tuned to manufacture high technology HDI (High Density Interconnection) PCBs. Products include large and thick HDI boards and also high density thin stacked microvia constructions. HDI PCB boards, this is the fastest growing technologies in PCBs, are now available at PCBSINO. HDI Boards contain blind and/or buried vias and sometimes contain microvias of .006 or less in diameter. 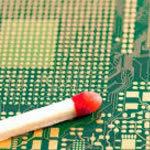 this will need laser drill, HDI PCB have a higher circuitry density than traditional circuit boards. 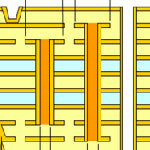 There are several types of HDI boards, through vias from top to bottom, with buried vias and through vias, two or more HDI layer with through vias, passive substrate with no electrical connection, coreless construction using layer pairs and alternate constructions of coreless constructions using layer pairs. High Density Interconnects (HDI) board are a board (PCB) with a higher wiring density per unit area than normal printed circuit boards (PCB). HDI PCB have smaller lines and spaces (<99 µm), smaller vias (<149 µm) and capture pads (<390 µm), I/O>400, and higher connection pad density (>21 pads/sq cm) than employed in conventional PCB technology. HDI board can reduce size and weight, as well as to enhance the whole PCB electrical performance. this Sounds simple but there is an average of eight additional steps to complete this unique process. Specialty equipment and trained technicians follow the process closely to achieve the perfect hidden via. Provide additional dielectric material & small geometry features. What are High Density Interconnector (HDI) Printed Circuit Board (PCBs)? 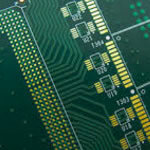 What are the current limits of Bittele Electronics’ HDI PCB fabrication capability? What new capabilities are planned in the future? PCBSINO at Bittele Electronics have improved and upgraded our manufacturing facilities in 2016 to include HDI board fabrication and assembly. PCBSINO now provide manufacturing High Density Interconnect(HDI) PCB service in our comprehensive list of PCB fabrication and assembly capabilities. 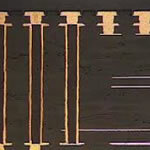 High Density Interconnect PCBs have a higher wiring density per unit area than conventional PCBs and are utilized in complex small form factor designs. High Density Interconnect PCB (HDI PCB) helps reduce size and weight, as well as enhances electrical performance of a device. Shorter PCB manufacturing lead times and improved device performance for Flip Chip, BGA, MCM, SIP technologies and medical devices. Allows utilization of technologies that require ultra thin cores, fine line geometries and alternative via technologies for enhanced thermal transfer in the case of a thermal PCB.